Pump mechanical run test is performed for 4 hours to proves pump work in stable condition and all variables are within acceptance range. The mechanical run test is performed after successful completion of the pump performance test and net positive suction head test. Based on the API 610, the pump shall be run for 4 hours at the "rated flow" and pump operating parameters shall be recorded periodically e.g. in each 10 min or 15 min. The data collection normally started after stabilization of lube oil temperature. The warm of process shall be elapsed since the measured values will not be stable and might indicate fluctuation. The pump normally runs for 30 min to 45 min to get ready for mechanical running test data collection. 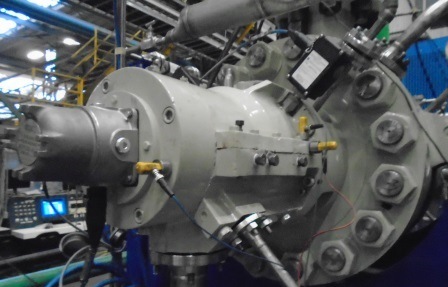 The assigned third party inspector shall inspect the pump during the mechanical run test for the probable leak from joints and connections and also unusual noise or any abnormal situation. The mechanical run test might go very well until last minute and start to have leak or increase on bearing temperature or any abnormal condition. The test personnel shall be very diligent in all 4 hours and make sure all variables are within in the acceptance range. At the end of 4 hours, the pump manufacturer provides a mechanical run test report which indicates the collected data in each 10 or 15 minutes. These test report shall be checked aginst pump approved datasheet or pump mechanical run test procedure. The pump manufacturer provides the bearing housing vibration data and shaft vibration data. The review process is as the same of the performance test but in the mechanical run test; the test is done in the "rated flow," so one acceptance range will be used for all plots. The value of overall vibration and discreet vibration value shall be less than specified values in API 610 or approved test procedure. After successful completion of the mechanical run test, the pump is dismantled, and rotating part is subjected to the visual inspection. The shaft bearing contact and bearings contact surface are inspected for any probable wear, scuff, burn, etc.